This recipe is for all of you macbook air (pre-oct 2008 owners) who are lusting after those macbook pro and macbook air users w/the four finger gestures. Back on 10.5.6, user michaelb over at macrumors found a way to enable four finger gestures. As expected, once i updated to 10.5.7, my four finger gesture mod was gone. However, enabling four finger gestures is just the same as on 10.5.6. Again, be sure to backup your current AppleUSBMultitouch.kext file and as always when modifying kext files; you can make your machine not boot by doing this so you’ve been warned. First things first, upgrade to 10.5.7. Next, we will be editing the info.plist in the AppleUSBMultitouch.kext file to enable the four finger gestures. 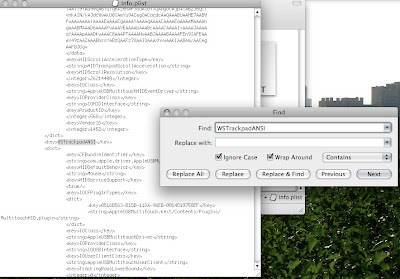 Find the AppleUSBMultitouch.kext and right-click on it and choose to Show Package Contents. 1a. however if you want to modify this yourself, go into the Contents folder and right-click on the Info.plist file. 1b Do this for the WSTrackpadANSI2, WSTrackpadANSI3, WSTrackpadISO, WSTrackpadISO2 entries (should be all in a row). The WSTrackpadJIS3 entry should already have the 4 lines so you are done once you find this entry. 2a. Finally, go to Applications – Utilites and open Disk Utility. Click on your main system drive and go to the First Aid tab and the Repair Permissions.